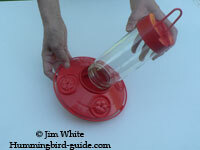 Dr JBs Hummingbird Feeder Review. 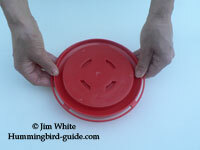 We were asked to do a Dr JBs Hummingbird Feeder Review. 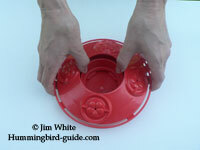 Since I’m a “Glutton for hummingbird feeders”, I couldn’t resist, especially since I heard so much about this feeder. We have multiple feeders surrounding our home, one in just about every window and several out in our perennial garden. Needless to say, I spend a lot of time cleaning and replenishing the nectar supply to these feeders. The feeder arrived in a nice strong box (I like nice boxes, I use them year to year to store my feeders over the winter). 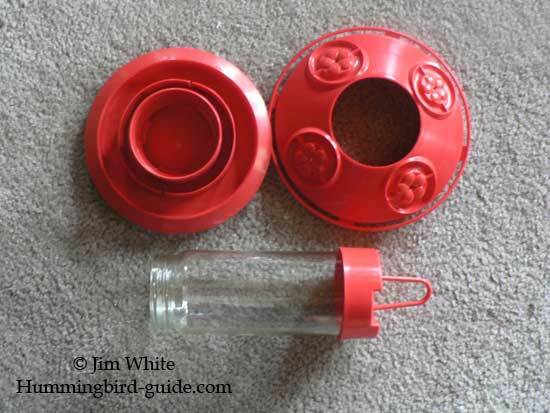 Upon opening the box, the feeder came in 3 pieces: 2 plastic pieces that snap together to form the bottom/tray of the feeder and a glass screw-in bottle/reservoir with a large loop style hook for hanging. I immediately noticed the quality of the 2 plastic pieces. They were strong and flexible, a sign of a better material that won’t crack or shatter. 4 bee resistant feeding ports and a continual encircling perch. The 2 pieces snapped together easily and definitively. The reservoir was a heavy glass jar and screwed into the bottom again with ease and seemed to make a very good seal. The inner and outer pieces of the base came apart with a snap and were very easy to clean with no nooks or crannies to promote mold and bacteria growth. I simply used my feeder brushes with a very mild solution of soapy water. 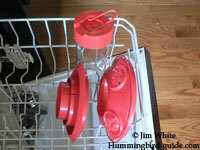 If your stressed for time, the whole feeder is dishwasher safe placed in the top rack. Purchase the Standard Dr.JB's Feeder. Now Available in Multiple Sizes! Red or Yellow flowers on the feeding ports. Also available is a 48 or 80 oz. size with 8 feeding ports. You can see all the different sizes here. Unscrew the bottle from the base. Lay base upside-down on sturdy flat surface. The inner part of the base will “pop” loose. top rack of a dishwasher. 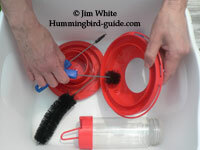 The Dr.JB’s hummingbird feeder is strong, simple to assemble/disassemble, easy to clean and fill. This feeder is well worth the money. The quality of the material and design are of the best available. I’m sure I will get years of service through generations of hummingbirds returning to my feeder. For a “Basic” style feeder I think this feeder is the best I have seen. In the “Basic Feeder” category, I give it 5 stars and highly recommend it. I can personally attest to the "Bee Resistance" of the Dr. JB's feeders! We had a Honey Bee invasion on one of our feeders in August, 2015. They completely occupied the feeder to the point where our hummingbirds could not use the feeder. I noticed that the bees were investigating each of the 12 feeders we have hung around our house. They would land on the feeders to see if the nectar was accessible. The bees did not take over the Dr. JB's feeder because the nectar level was low enough to prevent the bees from reaching it when they stuck their heads through the feeding ports. 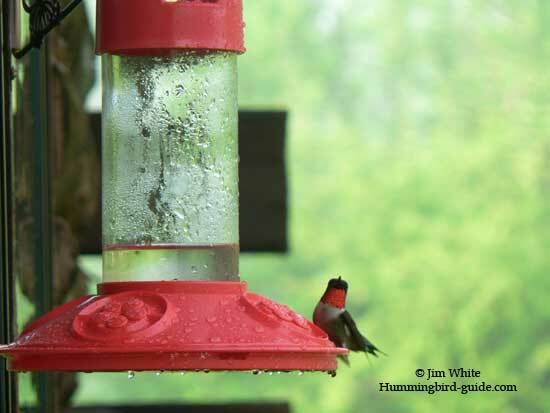 The level, however, is easily accessed by our hummingbirds because of their long tongues! 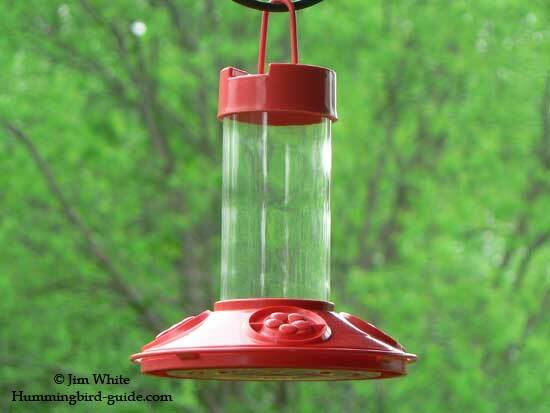 To learn more about dealing with bees and a Honey Bee invasion on hummingbird feeders, you can visit our "Hummingbird Feeder Bees" page.